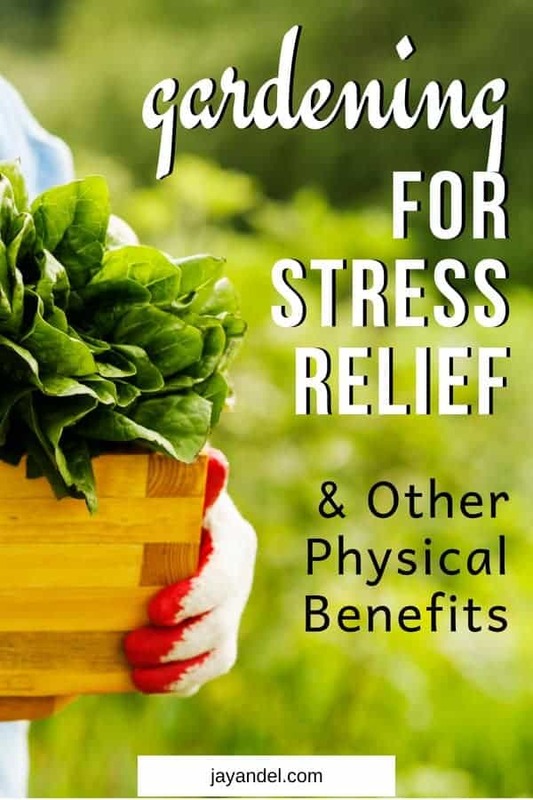 Gardening for Stress Relief - An Anecdote To Mental Suffering Plus A Multitude Of Benefits. Gardening has often been prescribed as an anecdote to mental suffering such as stress and anxiety plus gardening as a stress reliever provides a multitude of benefits. Digging in the earth, enjoying the warm sunshine and watching living things grow are huge stress-relieving rewards for your gardening efforts. Beyond the obvious benefits of mental restoration, you should also consider gardening as a physical activity that can bring restored health and vigor to your body. When you feel good from being outdoors and creating something substantial in the way of beauty or food for the garden, your sense of well-being will multiply tenfold. Studies show that gardeners have more optimism and appreciation for life than non-gardeners. The good thing is that you only need some houseplants or a small space in a window or on a patio to get both mental and physical satisfaction from gardening. As well as being a great anti-depressant, gardening is also great for what ails the body.
? You can greatly lower your risk of osteoporosis as you age by getting the physical exercise you can get from gardening.
? Your bones are improved by the natural movement and activity you gain from gardening. One amazing scientific study found that women who engaged in gardening activities and work in the yard had much lower rates of osteoporosis than even swimmers and joggers.
? Carrying loads of soil and compost, pulling weeds, digging holes and bending over to plant tend to keep osteoporosis from attacking your body. And, the mental satisfaction may also ward off the stress that leads to bone and muscle problems.
? Another physical benefit of gardening is the rest you receive afterward. Studies with those who have problems with anxiety and forgetfulness show that gardening promotes better sleep and rest – boosting physical stamina.
? One factor in managing diabetes is getting enough exercise.
? Gardening can provide at least 150 minutes per week of well-needed exercise – especially for those who have sedentary jobs.
? Fresh produce is another factor in gaining physical health from gardening. The more healthy changes you can make to your diet, the better you’ll feel. You can also better maintain a healthy weight by eating fresh veggies and fruits from your garden.
? Whether gardening to bring beauty into your life or to eat and become healthier, being outdoors and creating from nature’s bounty can work wonders in your life. There are many books and online help available for beginning gardeners and so many fun ways to garden.
? Tower gardening, hydroponic gardening, raised bed gardening, and many more types can provide the mental and physical boost you need to keep your health in check and to provide many hours of fun and relaxation to your life. Check with an expert at your local nursery about how you can create as much or as little gardening activity in your life as you want and need. If you dread going to the gym or afraid that running and jogging might be harmful to your body, gardening is a great exercise to begin a journey that will provide physical wellness. If you suffer from stress-related physical problems, try gardening as a fun and relaxing way to nourish the soul and the body. As always, I value your opinion, so please use the comments section below! Follow us on PINTEREST for more Gardening Tips!